It’s that time of the year when you and your family take your annual vacation. You and thousands of other families are going to leave your homes for three to 12 days to find colder slopes or warmer beaches in an effort to unwind and recharge. As a homeowner in Newark, you’re aware of the danger of leaving your home alone for an extended period of time. But do you know how to keep your home safe while you’re gone? 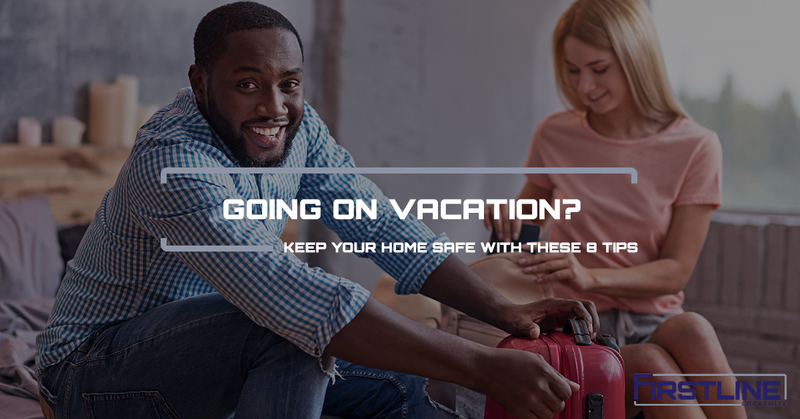 In this post, Firstline Locksmith in New Jersey is going to share eight tips on how to keep your house safe while you’re on vacation or gone for an extended period of time. Leaving last minute for vacation may be “spontaneous,” but it puts your home at risk. The less people know you will be gone for an extended amount of time, the greater the chance that your home may be a target for a burglar or criminal. You want to plan your extended time away with your local post office, your neighbors, and some friends and family in the area so that your home remains safe and secure while you’re gone. You can set timers on external lights to turn on and off at dawn and dusk to make your home look occupied while you’re gone. You can also request a friend or family member to check on the home once or twice a day, entering and exiting the home, so that it looks like someone is actually in the house. Finally, you can utilize your smart home technology to turn on and off electronics and internal lights to make it look like someone is home. You may leave your trash cans out on Thursdays, but if you leave them out all weekend, unlike your neighbors, it’s a sign that you’re not home: the only trash cans on the street are yours. What do you think a burglar will assume? They will at least watch your home to make sure no one is about and then target it for a break in. Did you know burglars use social media to target homes before they even see them? That’s right. You announcing your departure out of town is an easy way for burglars to know that you won’t be home for a few days to a few weeks. The best way to avoid this is to post your vacation, photos, videos, and more once you’re back home. This way, your vacation is offset by a week or two, and you won’t need to worry about burglars using your social media posts to target your home. Briefly mentioned above, employ your friends and family to visit your home while you’re gone. This will give people the illusion that someone is home, or at least watching the place regularly. Have your friends and family irregularly check on the home so that potential burglars do not determine a pattern and simply break in while your friend or family member is away. This will cost you some money, but it’s much less than replacing stolen electronics or repairing home damage due to a break-in. In fact, there are sites you can register your home on so that travelers can watch your home simply to have somewhere to sleep for a specific duration. This may be a great option for you. Otherwise, find someone you can hire to stay at your home while you’re away on vacation. Do you have a safe at home? Do you have a secure room you can store valuables in? Whether you trust your door locks or not, you can always add a layer of security with a safe or secure room. Those who collect art, valuable sentimental items, or simply want to keep their belongings safe can lock them in safe or secure them behind a heavy-duty door, deadbolt, and lock. You read earlier about using your smart home technology to turn lights and electronics on or off periodically. You can also use the technology to record the interior and exterior of your home with a security camera system. Granted, cameras will record events, but they won’t stop a burglar. In fact, you can use smart home technology to alert local authorities of an unwarranted entry or break-in at your home. As aware Newark homeowners, you can probably think of some other ways to secure your home while you’re away on vacation. Consider all your options and implement a plan with friends, family, and the local authorities. The more people you involve in the process, the more secure your home will be while you’re gone. Need a local locksmith for your Newark home? Give Firstline Locksmith a call today!